Recipes Evolve ... Some Evolve More Quickly Than Others ... Your Feedback is Welcome. We at Weird Beard are striving all the time to make the best beer possible. We think we have some pretty nailed down recipes but we are not ones to rest on our laurels, so make small tweaks all the time to many of our brews. Hit the lights lost its crystal malt after about a year and it became in my eyes a much better beer. Decadence changed 4 or 5 times early on as we were perfecting the recipe. Saison 14 changed yeasts from wet French saison yeast to dried Belle Saison. 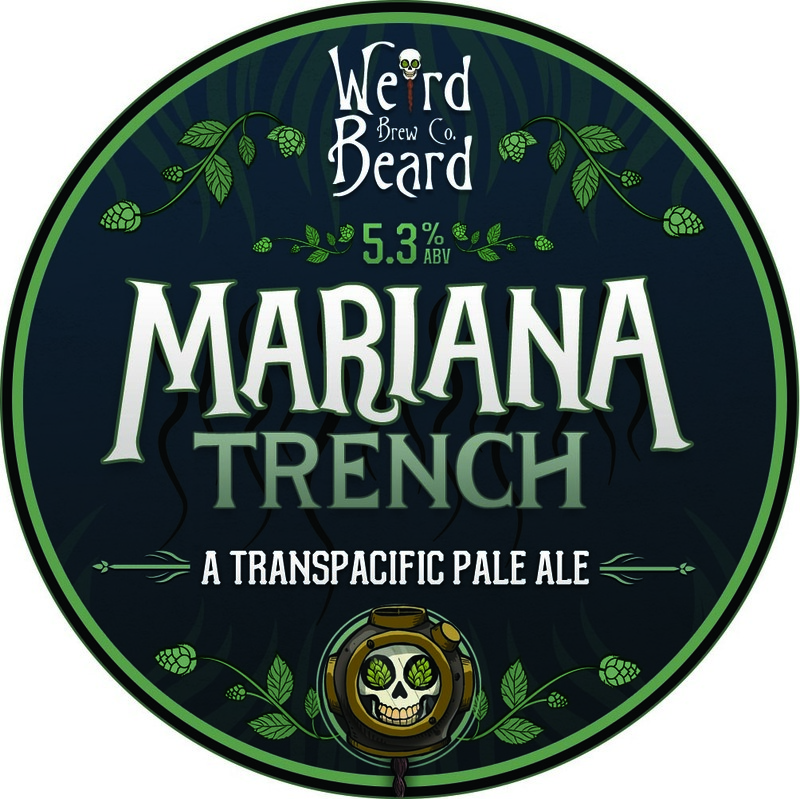 We added some Green Bullet into the dryhop schedule for Mariana Trench. This does fit in with our transpacific hopping schedule for Mariana Trench but the resultant beer tastes noticably different to the Mariana that we know. We would be very interested to hear what you guys think about it. Look out for Batch 216 in bottles and kegs and casks around and about for the next few weeks and let us know what you think of this change. Earlier this year, we had Matt Curtis come pay us a visit at the brewery. He was on a mission to relaunch his blog with a new look and did so with by putting out a very transparent piece on us. He then approached us a short while after with an awesome proposal for London Beer City. Here he's announced the event details. What this entailed from us was a collab brew with The Duke's Head Highgate pub-team and Matt himself, for something that'll work particularly well on cask. Even though we don't put out many firkins, we do think cask is important and doing this collab was a no-brainer decision. We got the ball rolling on this one pretty fast. We had 3 potential weekends in June to execute this brew and have enough time for the beer to be ready; only 1 of those weekends was actually doable. We really knuckled down in brainstorming, scheduling, recipe development and ordering stock with regards to this new exciting beer. The enthusiasm and all-rounded effort was impressive from the very start. Matt suggested a West-coast inspired Red I.P.A with real resinous hop character. "None of that juiciness" he requested as admittedly, we'd all been having a lot of juicy, fruity I.P.As. We wanted something different and our boy Jonny, having spent a lot of time in the USA, sunk his teeth into the recipe and came up trumps. So how did this Pacific Northwest Style Red IPA actually come into fruition?! The brewday itself was a Saturday and we were a team of 4: Bryan, Natasha, Matt and the pub GM, Tom Harrison. Between us, we were dab hands at digging out the mash tun, weighing out a hell of a lot of hops, ploughing through the cleaning and having the beer transferred into the FV by lunchtime. You can see Tom rocking a Weird Beard overall in the odd photos we managed to take of each other hard at work before settling down with a tasty beer in hand, courtesy of Curtis. For this beer to be true to style, we've mashed in speciality malts, like caraRed, for the desired colour and graham cracker sweetness. Tasting this beer, you won't feel disappointed by the delicious malt character and we're pretty stoked we've hit the nail on the head here. We've also armed the brew with a big addition of clean bittering hop, Magnum so you really have the bitterness lingering in the after-taste. As well as Magnum, we've chucked in hearty doses of some of the United States' finest hops: Chinook, Nugget, Columbus and Simcoe to give the beer the dankness we had sought after. You may enjoy The Duke of Dank, launching on keg and cask at The Duke's Head Highgate from Wednesday 12th August and on keg over the weekend at London Craft Beer Festival.